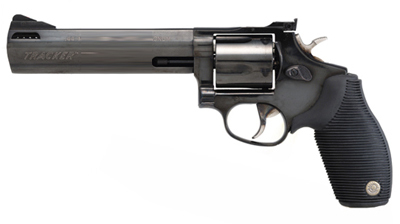 I have a couple of magnums I like – a Rossi .357 revolver for general use, plus a Ruger Blackhawk .357 Maximum, which is somewhat unique. I’ve never owned a .44 magnum, but I’m not in the woods much and unlike Dirty Harry, I’d rather have 14 rounds of .45 in my belt than 5 rounds of .44 magnum. But one day this past week a coworker stuck his head in my door and asked if I’d be interested in a .44 Magnum Taurus Tracker for what I thought was more than a reasonable price. I asked about it’s condition and he said “like new.” I said, sure, thinking at that price I could resell it and make a little profit. He brought it in the next day. It was a little dirty from being fired, but otherwise in excellent condition. I bought it, then went Bass Pro and bought a box of .44 magnums and a box of .44 specials. The next day I was scheduled to conduct a CHL qualification course at the range at 6:00 p.m. I went early with the .44 and my .357 Max along with some reloads I’d done for it. I shot the .357 first. It’s a handful with the Maximum cartridge. I had loaded these at the bottom end of the powder recommendation for what I thought was a similar bullet, but it exhibited enough power, I don’t think I’d want to go any higher. Then I shot 5 rounds of magnum through the .44. It’s ported and the amount of fire coming out of those ports was amazing. Would have been blinding at night. The recoil was pretty strong, too. And the boom. It was loud, kind of like when we shoot Jerry’s .50 caliber Desert Eagle. I next tried some .44 specials. I could shoot those all day long. Although they appear similar to the .44 magnums on the outside, they have a much lighter load on the inside. It’s still plenty of cartridge, but the recoil is very mild, the muzzle flash not even noticable, and the noise somewhat tame. After shooting I went out to the firing range office to wait for my students. 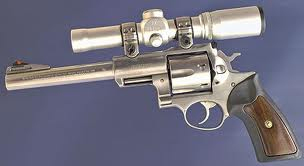 A guy came in with a Ruger Super RedHawk .44 magnum with a Charles Daly scope on it. He said he had inherited it from his dad and wanted to sell it for $400. Had I not bought the Tracker the day before, I’d have been tempted. Both of the guys behind the counter contemplated it. One was discouraged by his girl friend, who happened to be there at the time and the other said he didn’t really have the funds, but if he did, he’d buy the gun. The owner wanted to shoot his gun some before selling it, so rented a lane. After he went to the firing line, I pulled out the Tracker and said, I could sell it for $350. It garnered more attention than the Ruger for some reason. It couldn’t have been just price because mine didn’t have a scope and $50 difference isn’t all that much. The two guys that wanted to buy the Ruger suddenly wanted to buy the Tracker. But again, the same two hindrances were there: for one a girlfriend helping him watch his money and for the other, no money to spare. That RedHawk is a beautiful gun and it will sell at that price pretty quickly. As for the Tracker, I don’t care if somebody buys it or not. I might kill a hog with it someday. Next Next post: The Family That Shoots Together . . .